Small student/teacher ratio insures opportunities for individualized instruction. Spacious, well-equipped rooms with learning centers provide opportunities for active hands-on exploration, discovery and learning. Developmentally appropriate practices promote optimal learning and development. Thematic units teach language arts, math, science, social studies, music and art through a wide variety of meaningful activities and experiences. 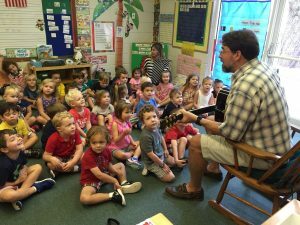 Music, Movement and Art classes provide additional experiences to integrate the arts into our curriculum and encourage creative expression. Spiritual development takes place throughout our daily routine and is enriched with Bible Story Time in the Sanctuary weekly. Bimonthly field trips and in-house programs enrich and expand our units of study. Spanish instruction takes place in the classrooms. 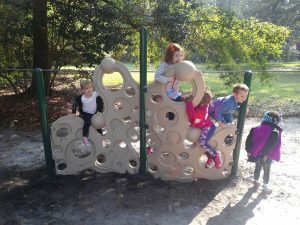 Daily outdoor play encourages gross motor skill development and additional social interaction. 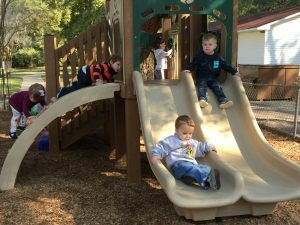 Two playgrounds provide separate play areas for toddlers and our older 3’s and 4’s.